Who Is Merrick B. Garland? Get to know President Obama's SCOTUS pick. At a news conference at the Rose Garden this morning, President Obama announced he is nominating Merrick B. Garland, the chief judge of the U.S. Court of Appeals for the D.C. Circuit, to the Supreme Court. Garland has a long, hard slog ahead of himself after Senate Republicans said they would refuse to consider any of President Obama’s nominees following Justice Antonin Scalia’s death. Of course, the Republican position required Obama’s choice to be a strategic one, because politics does not let you live your best life. We’ve collected some pieces on the who and why Garland below. On the appeals court, Garland has been a moderate liberal, with a definite pro-prosecution bent in criminal cases. Indeed, his views in the area of criminal law are considerably more conservative than those of the man he would replace, Justice Antonin Scalia. But Garland has also been a persuasive voice for liberals, managing to bring conservatives over to his side on issues ranging from the environment to national security. For example, in a case involving Chinese Uighurs detained at Guantanamo Bay, Cuba, Garland asked the Justice Department for the particulars of its evidence and then wrote an opinion for himself and two conservative judges that concluded that the Bush administration’s claim that they were enemy combatants was utterly unsupported by the evidence. Garland’s nomination is challenging Republicans to continue to promote their stance of non-consideration, even when the pick is someone many of them like. Because of his position, disposition and bipartisan popularity, Judge Garland has been on Mr. Obama’s shortlist of potential nominees for years. In 2010, when Mr. Obama interviewed him for the slot that he instead gave to Justice Elena Kagan, Senator Orrin G. Hatch, Republican of Utah, said publicly that he had urged Mr. Obama to nominate Judge Garland as “a consensus nominee” who would win Senate confirmation. But Mr. Obama ultimately opted to save Judge Garland for when he faces a more hostile Senate and needs a nominee with more Republican support. 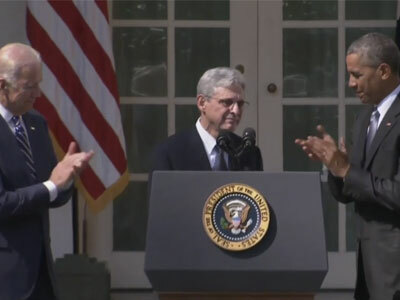 Democrats expect to lose seats in this fall’s election, so if another Supreme Court seat comes open next year and Mr. Obama has a substantially thinner margin in the Senate than he has today, Judge Garland would be an obvious choice. There was not a single case I worked on with him, from the most mundane Federal Energy Regulation Commission matter to a 20-plus-year-old civil rights case, in which politics played into his considerations. Conscience, sure; Judge Garland often reminded me that there were human beings on both sides of these contentious cases, but never ideology. Garland has been a judge for almost nineteen years and a chief judge for three. He has developed an indisputably illustrious record; he has proved himself to be the moderate, first-rate judge whom, in the mid-nineties, Republicans as well as Democrats one-upped each other in predicting he would become. Garland is, to borrow the terms Obama used last week in describing his nominee, an “outstanding jurist” with “impeccable legal credentials, who, by historical standards, would not even be questioned as qualified for the Court.” By historical standards, he should be quickly and unanimously confirmed.